I'm ready to talk about pizza. I've been playing with it for a while now, but I didn't want to post about it until I was comfortable enough with the process to feel like I knew the subject well enough to discuss it. And that meant waiting until I had a finished product that was photo-worthy as well. And something that tasted good (and tasted like pizza). 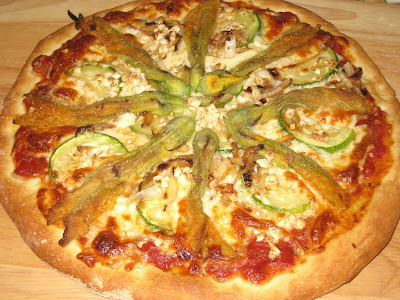 And while I still have a ways to go, I am quite pleased with one of my more recent creations, the Zucchini Blossom, Zucchini and Garlic Pizza you see above. For this post, I'm going to start with the crust. What inspired me to make pizza was a recipe I found in the January/February 2009 edition of Tastes of Italia, a modest little magazine that I will pick up every now and then in the checkout aisle at Treasure Island, and in which I have found many ideas and inspirations. While they do have recipes for the kinds of dishes we think of as Italian, what I really like about this magazine is that they more often provide recipes using the ingredients that we think of as being Italian, but in a way that is nothing like the dishes we tend to think of when we think Italian cuisine. This issue had a recipe for Pizza Margharita (basically tomatoes, fresh mozzarella and fresh basil), that included a recipe for "Basic Pizza Dough." It seemed like a good place to start. The instructions were simple and fairly straightforward. It tasted good, but it did not have that chewy texture that I like in my pizza. It also made enough for four pizzas, which is at least two more than I can deal with at one time. I used whole wheat white flour, which may have accounted for the crust being less chewy and not tasting exactly like pizza crust should taste. But it looked pretty, as you can see. At first it was easier for me to roll out a rectangle than to try for the circle. I had seen Sara Moulton pre-cook her pizza dough for five minutes before putting the toppings on it, so I did the same thing. It helps the crust stay crisp and crunchy under the fillings, so that has become a part of my regular pizza routine. The topping was my own creation, utilizing whatever ingredients I had on hand that could be considered remotely Italian. 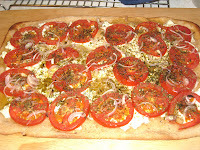 I used ripe tomatoes, some ricotta cheese I had left over from an earlier use, a thinly sliced shallot and olive oil. I did not have any fresh basil, so I used dried thyme and basil. It did taste good, but I wanted to see if I could do better. 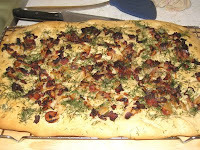 The next recipe that caught my eye was a foccacia recipe in Mario Batali's cookbook Molto Italiano. I also used white whole wheat flour, and I knew something was wrong the first time I made it. It was thick and dry, and barely rose. Luckily, it tasted ok so I was able to eat it, but it was definitely not foccacia. I thought maybe it was because I used the white whole wheat flour instead of the high-gluten bread flour called for in the recipe, so I moseyed on down to the grocery store and bought a bag of Bob's Red Mill unbleached white flour ("superb for bread baking") and tried again. And while better, it was definitely still too thick and dry. So I googled around and discovered I wasn't the only one having this problem. I changed the half cup of water to one-and-a-half cups, and lo and behold: I got foccacia, as you can see on the left. It was light and yeasty, and especially tasty with the pancetta and herbs, but it was no pizza. Emboldened by my foccacia success, I decided to find another recipe to try for pizza crust. As luck would have it, there was a recipe on the side of the Bob's Red Mill flour bag. I thought they were awfully confident to call it "Perfect Pizza Crust," but the ratio of ingredients looked consistent with the other recipes at which I had been looking, so I decided to give it a try. And it worked out beautifully, so beautifully that I don't think I need to look any more. To the left is the first pizza I made (each recipe makes two pizzas). The crust was crunchy, crisp, and chewy all at the same time, which is my preferred pizza crust texture. I got a little carried away with the toppings, though. I loaded up on the tomato sauce and cheese, so the bottom was just the slightest bit soggy. The red peppers and the beet greens were a good match, though, and I knew I was on the right track. I took what I learned and maximized the flavor for my next effort, up there on the top. There's a new sustainable farmers' market on Wednesday evenings up in Andersonville and I just started working in the neighborhood so I stopped by on my way home from work and saw the freshest, most beautiful zucchini blossoms I've ever seen, much prettier even than the ones at the green market. I had to buy them and, having bought them, knew they were destined for that night's pizza. It was even more fitting that I had already planned for the zucchini. A liberal sprinkling of chopped garlic over the whole thing has become signature on pretty much all of my pizzas. It takes it from merely delicious to sublime. I know my pizzas will only get better with practice, but I consider this pizza to be my first real authentic pizza pie. The crust was perfectly browned and there was no hint of soggy. The toppings were perfectly cooked and in perfect unison with each other. I can't wait to play around some more. If you've never worked with yeast, but have been wanting to try, pizza is a good place to start. There is less rising and kneading time involved, and it doesn't take as much time. You can work up the dough one night and throw it in the refrigerator for as long as two days before you have to use it, or you can even store it in the freezer to have on hand on a night when you're craving a pie but don't have the time or energy to start from scratch. One recipe makes two pies, so you can feed a larger group, offer more choices, or make them at different times. I used the unbleached white flour all by itself the first few times I made the pizza because I wanted to be sure I understood how the dough should look and feel as I was working with it, so I could be more confident experimenting. I have since substituted white whole wheat at a 30 percent ratio (one-third the total amount of flour), and will continue to increase the amount of whole wheat. I don't know if I can achieve the same crisp, chewy texture with 100 percent whole wheat, but that's my goal. You don't have to use Bob's Red Mill unbleached white flour, but you want to make sure the flour you do use is high-gluten, or says "bread flour" somewhere on the package. As far as toppings go, the sky is pretty much the limit. You can go the more traditional route, with a scant cup of your favorite tomato sauce as the base, followed by about one-and-a-half cups of mozzarella cheese and then whatever other ingredients you want, or you can be bold and play with whatever wild and crazy combinations present themselves to your eager, experimental mind. If you find something amazingly good, please let me know. Combine the flour, salt and sugar in a small bowl and whisk together to mix well. Place warm water in a large bowl and add the yeast, whisking it together. Add the oil, and then the flour mixture and stir with a wooden spoon until the dough comes together. Turn the mixture onto a floured surface and set the bowl aside, pouring about 1 teaspoon of olive oil into it. Bring the dough together into a ball and knead, sprinkling more flour over the dough if necessary, until the dough is smooth and elastic and is just at the point where it is not sticking to your hands. Try not to add too much flour. Form into a ball and put it in the bowl with the olive oil, turning it to make sure the entire surface is coated with the oil, adding more oil if necessary. Cover the bowl with a damp cloth or plastic wrap and let rise until it doubles in size (between one and two hours). Turn the dough out of the bowl and divide it in half. At this point you can either make both pizzas, make one pizza and put the rest of the dough in the refrigerator for two days, put both balls of dough in the refrigerator for up to two days, or freeze one or both balls for future use. If you put the dough in the refrigerator or freezer, let it come up to room temperature and then proceed with your pizza. If you are making the pizza right away, move the oven rack to the lowest position and preheat the oven to 475 deg. F. and sprinkle some cornmeal on your baking sheet (you can use a round or rectangular sheet). Roll out or pat out the dough until it fits the contours of the baking sheet, pinching out the dough to make it slightly thicker around the edge. If your crust is ready before the oven has preheated, cover it with a towel while you wait for the oven to reach 475 degrees. You do not want to put the crust into the oven until the oven has reached the proper heat. Place the empty crust on the rack at the lowest position in the oven and bake for 5 minutes. Remove from the oven and top with your ingredients. Bake for an additional 12-18 minutes, until the crust is golden brown and the toppings are cooked. 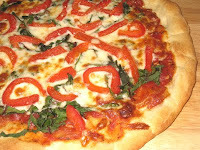 adapted from the recipe on the package of Bob's Red Mill Unbleached White Flour. *updated 12/12/09: It works just as well to use 1 cup white whole wheat flour and 1-1/2 cups bread flour. *updated 06/08/14: I probably should have mentioned from the beginning that you can use any kinds and any amounts of flour, as long as the total comes to 2-1/2 cups.